There's a lot going on at utility SCANA Corporation right now. Here's what you need to know to decide if it's worth owning. SCANA Corporation (NYSE:SCG) is a utility with operations in the southern part of the United States. The stock is down 20% from the highs it reached in 2016, but that's still an improvement from the 40% low reached in the middle of 2018. In fact, the stock is up around 30% since late September. Is this a sign that the utility's fortunes are starting to turn, or that it's too late to jump in because the rebound has run its course? Or is something else going on? SCANA's troubles date back to its decision to build a nuclear power plant. Regardless of one's opinion on nuclear power, the construction process missed deadlines and was over budget. And when Westinghouse, the utility's contractor, declared bankruptcy, SCANA decided to scrap the whole project in the middle of the construction process. This set up a contentious battle between SCANA and its customers and regulators. The big problem is that SCANA customers had already been paying for the scrapped nuclear project and, worse, would have to continue to pay for it even though it would never get built. It's easy to see why rate payers and government officials were, to be polite, a little upset. The conflict ended up in court, and at the same time, state politicians have been attempting to force the company's hand via additional regulation. It has been an ugly ride. SCANA has already cut its dividend by 80% because of the troubles it faces. The yield is a miserly 1% at this point, which is pretty abysmal for a utility. And with all of the pushback following the nuclear project's failed ending, it's hard to get confident in the sustainability of even that payout. The one piece of potentially good news is that Dominion Energy, Inc. (NYSE:D) stepped in and offered to buy SCANA. Dominion is notably larger than, SCANA and adding SCANA's assets to its portfolio would expand Dominion's reach in the southeast, where population growth is generally higher than in other regions of the country. However, the customer and regulator anger over the failed nuclear plant has been a major roadblock to the finalization of an agreement. Dominion has reworked its proposal, while keeping its main form in place, in an attempt to appease as many interested parties as possible. However, the utility isn't willing to make major modifications to the financial side of the agreement because the acquisition needs to make fiscal sense or it's a waste of shareholder money. So far, the merger has been moving slowly forward, gaining the approvals it needs from shareholders and regulators. It hasn't been a smooth or easy process, and there are still more hurdles that could derail the deal. In the meantime, Dominion has been doing fairly well in terms of earnings. It believes it's on track to meet its 6% to 8% annual earnings growth target through 2020, with around 5% growth thereafter. Dividend growth should trail along with earnings growth. Add in a 4.4% yield, toward the high end of the utility space, and Dominion looks a lot more appealing than troubled SCANA, where one-time charges and nuclear troubles (which are clearly related) have been an earnings headwind. The unfortunate thing with SCANA is that the company's core utility assets are, for the most part, doing OK. The trouble largely stems from the nuclear issue, which will likely be an overhang for many years. That makes it a high-risk, special-situations investment option at best. Most investors should avoid it. However, an investment in Dominion might be a good alternative. Dominion is a better option today on a stand-alone basis. However, as a larger utility, SCANA's troubled business will be a smaller issue within Dominion, assuming the acquisition goes through. 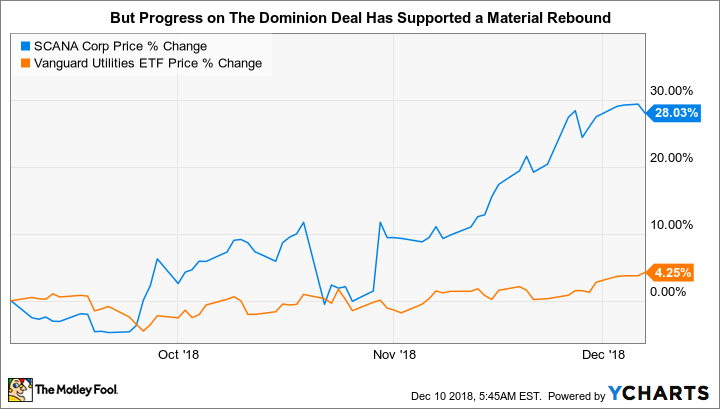 And based on its expectations of the deal, Dominion believes the purchase of SCANA, inclusive of the nuclear issue, will boost its long-term growth prospects. If the deal doesn't go through, though, there's no big change to Dominion's current prospects. 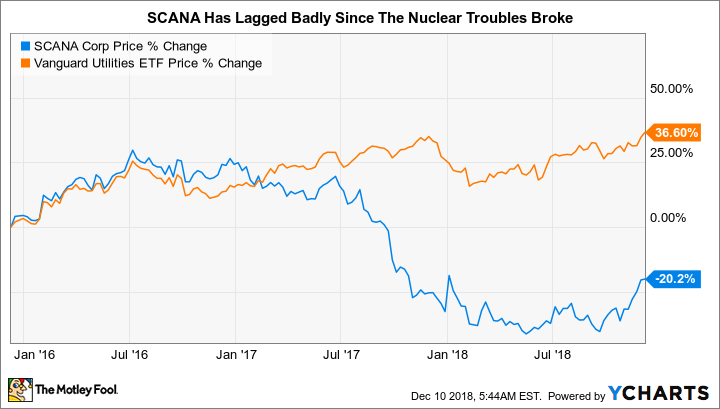 If you buy SCANA and the deal doesn't go through, the stock's gain since September would likely evaporate as investors will have to reevaluate the long-term impact of the nuclear fiasco on the company's future. While special-situation investors might find SCANA appealing based on the Dominion acquisition, most investors should err on the side of caution, here. Either avoid the whole issue and find another utility, or sidestep a lot of the risk by acquiring Dominion. That would mean, if everything goes as planned, you'd end up owning SCANA without the lost sleep that a direct investment in SCANA is likely to cause. In the end, if Dominion's purchase of SCANA falls through, the pain will most likely fall on SCANA shareholders. That makes SCANA a poor risk/reward trade-off right now.